Most hunters have the iconic image of a classic western elk camp burned into our minds. 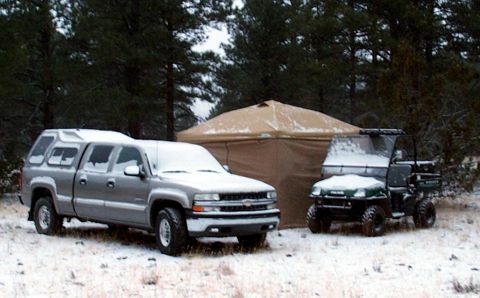 At the center is a white canvas wall tent, sometimes referred to as a Montana wall tent, or as an outfitter’s wall tent. Well today I want to tell you about the Walmart Outfitter Tent. I bet you didn’t know that Walmart sells outfitter’s wall tents, huh? Well they do, sort of. It is inexpensive, and one man can set up a camp based on it in a very short time. 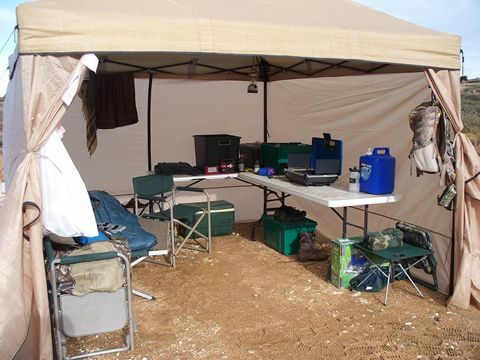 For many years now, my hunt camps have consisted of two main portable structures; a sleeping tent, and a screen house where the kitchen and other basic camp living functions are set up. A hexagonal Coleman screen house served us well for many years, until it finally wore out. But first, why a screen house anyway? That’s easy. In Arizona’s typical mild mountain weather, as soon as night falls and the lanterns get turned on, your camp will be beset by light-attracted insects. The screen house lets you keep your sanity while the evening camp chores are attended to. But even in Arizona, it does sometimes rain. Our solution to that was a HUGE plastic tarp that we threw over the screen house and staked down. That worked well, but was a hassle to set up. One man couldn’t do it efficiently. Take down and put-away was even more work, especially with pools of water still in the folds. So when the Coleman screen house finally gave up the ghost, I began a search for a replacement. The same Coleman model was no longer available. An important feature of the Coleman was an internal metal frame. I found several screen houses with external frames, but these did not suit. An internal framework is very useful to hang stuff, such as jackets, towels, lanterns, backpacks, trash bag, etc. The ability to hang stuff gets that stuff out of the way, but still remain handy. So while at Walmart, checking out the screen houses they had available, I saw the First-Up canopy. It is one of those canopies with the accordion-style, or scissors-style frame. It goes for around $100 or less. It covers a footprint of 10’ x 10’. But the great thing about the First- Up canopy is that it has attachable walls that can be purchased separately. There is both a screen wall, and a solid wall. If the weather is nice, the screen wall is the preferred option, but if precipitation is in the forecast, the solid wall can be installed instead. And the accordion perimeter frame provides plenty of sturdy structure from which to hang stuff. For hanging hardware, I use rock climber’s carabiners clipped onto the frame bars. So when did I start thinking about the shade canopy as the functional equivalent of a Montana wall tent? Last year, I had a late November elk hunt north of Flagstaff. My two sons came with me for opening weekend, but they had to leave Sunday night because they had school on Monday. They slept in the regular sleeping tent, and for the first two nights, I slept in the back of the truck. When they started to pack up to leave on Sunday afternoon, I had intended to sleep in the tent that they were vacating. However, before I knew it, they had knocked down the tent, and had packed it up. Set up as camp HQ, the canopy is just big enough for the three of us. But I realized that with them gone, I would have room to set up my cot in there. This would be the first time that I would use the canopy in the manner of a one-man outfitter tent. The big test came after the guys had left. A decent snowstorm was scheduled to hit overnight. And did it! When the winds hit before I went to bed, I grew a little concerned. So I moved the truck and the Polaris Ranger close to the sides of the tent to help break the wind. Each of the four legs has a stake hole, and at the four top corners, there is a guy line that can be staked down as well to help aid stability in the wind. I was surprised when I awoke the next morning to find a little snow on top of my sleeping bag. The Walmart Outfitter Tent is not perfectly sealed against the elements. There is a roof-peak air vent, plus air can blow between the top of the walls and the roof fabric. The walls hang from the metal frame with no attachment to the roof. 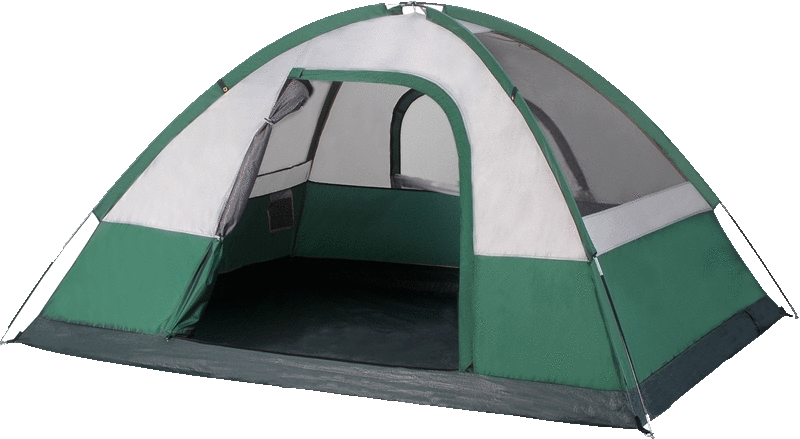 The roof fabric has ample overlap with the side walls that water does not run off the top and into the tent interior. Despite the light layer of snow that I found on me, I slept well all night and the sleeping bag was dry. Like most outfitter tents, this one has no floor. I got hit again with snow and rain on this year’s deer hunt. There was no snow or water on me this time, but when I awoke, I found a tiny stream running across the dirt floor. In hindsight, I could have dug a diversionary gully on the uphill side to channel away the flow. Live and learn. For cold weather, a canvas wall tent is equipped with a wood-burning stove with a metal chimney. I just use a propane-fired catalytic heater. This seems to be enough for temps down into the thirties, maybe lower. As explained, the tent is leaky enough to air flow that there is no issue with possible CO poisoning. And I only use the heater before hitting the sack in the evenings, not all night long. So there you go. 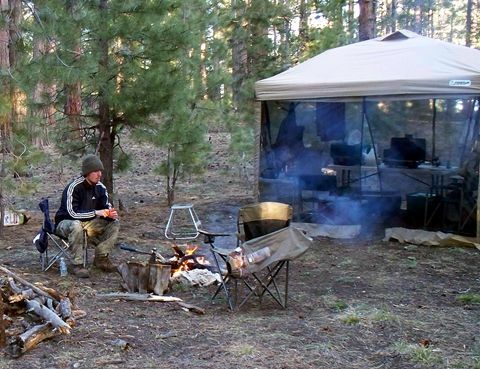 It’s not perfect, but generally speaking it is a good quality, comfortable substitute for a wall tent that’s roomy, versatile, low cost, and easy to set up.